Verbal vs. Oral – What’s the Difference? Home » Verbal vs. Oral – What’s the Difference? In many contexts, oral and verbal seem to be synonymous. Sometimes they are: you have probably heard people ask for both oral and verbal reports, meaning they want you to say something to them out loud. When we look more closely at the meanings of oral and verbal, though, we discover a few nuances that make choosing one of these words a bit more difficult. In this post, I will compare verbal vs. oral and use each word in several example sentences that show its use in proper context. I will also show you a mnemonic device that makes it easy to remember whether verbal or oral is the proper adjective to describe something. What does verbal mean? Verbal is an adjective. It means of or relating to words, whether spoken or written. This means that verbal can be used to refer to speech or written text, since it means anything relating to words. For example, verbal abuse does not necessarily mean spoken abuse. It could be abuse from a letter, email, newspaper article, etc. In everyday use, however, verbal is usually used to refer to spoken language. Generally speaking, when people say verbal praise, they mean praise that someone has said out loud. Likewise, verbal consent is consent that you give by speaking, rather than signing a consent form. Children learn to understand and use verbal language at a very early age. Verbal consent is usually sufficient to begin treatment in urgent situations, but can become problematic if legal issues arise. The narrow use of the word to mean only speech or spoken words is somewhat problematic, however. Since verbal means related to words, not related to spoken words, verbal can be applied properly to any context where words are used. As I already mentioned, verbal abuse is not limited to spoken words. The important takeaway is that verbal doesn’t exclusively mean spoke. It can also refer to written words. What does oral mean? Oral is also an adjective. It means of or relating to the mouth. Proper oral hygiene, for instance, involves brushing one’s teeth on a regular basis and drinking plenty of water. Oral has a secondary meaning that overlaps with verbal: it describes information communicated through the spoken word. Oral is more specific than verbal, since written language is not communicated via the mouth. Thus, oral only refers to spoken language. Therefore, oral instructions are instructions given by one person through another via speech. A culture with a rich oral tradition may pass down its history and stories via the spoken word, even if they are not written down. An oral examination is a test wherein a person speaks answers, rather than writing them. When Kirsten broke her arm, she was allowed to take oral tests instead of written tests, with the rest of the class. James had an oral disease that infected his gums and caused him to bleed profusely from the mouth. As you can see, oral has a much more restrictive use that verbal. While verbal can mean spoken or written words, oral can only mean spoken words. If you are describing something involving the physical mouth, use oral. In situations where you are describing something communicated through words, the situation becomes a little bit tricky. Oral can only describe spoken language. Verbal usually describes spoken language, but could (and should) refer to written language, as well. 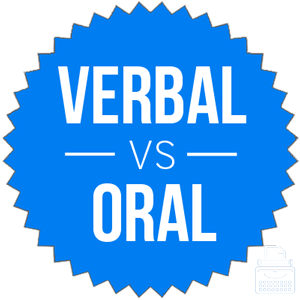 Oral vs. Verbal Check: Since oral and spoken both contain the letter O, you can easily remember to use oral when referring to spoken language. Is it oral or verbal? Oral and verbal are adjectives that mean related to the mouth and related to words, respectively. They are both used to refer to spoken language, and while both are appropriate, oral is more specific, and thus a better choice in many contexts. 1 What is the Difference Between Verbal and Oral? Omelet vs. Omelette – Which Spelling is Correct? Rollout or Roll Out – What’s the Difference?